Athough the Benro DP-70 Panorama "Head" (as called by Benro) was first introduced in September 2014 during the Photokina Show, there was neither much publicity about it hence. Nor is there any reference to it in the international Benro website(s). 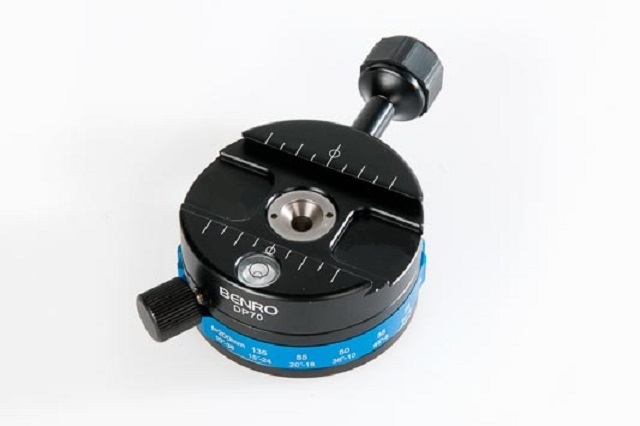 Despite the fact, that it is not actually a Panorama Head but rather a Panoramic Arca-Swiss® compatible QR clamp, which nevertheless may be the base of a Benro Multi Row Panorama Head, it is worth mentioning since it features a most innovative indexing mechanism. The whole unit seems like an evolution of the Benro PC-1 Panorama Clamp (reviewed quite a long time ago), with the addition of a V.I.S.A. (Various Indexing Step Adjustment)* which actually is a Selector with six detent interval options and a seventh stepless option. Total width w/ screw knob: 125 mm / 4.91"
As we can see in the following video, the seven detent interval options (click stops) are selected via an I.S. Dial (Indexing Step Dial)* ring on the perimeter of the DP70 panning base, unlike any other indexing rotator. *V.I.S.A. and I.S. Dial accord to Benro's own naming conventions. BENRO Panorama head DP70 from Jack Benro on Vimeo. The DP70 can be mounted directly on a tripod top mounting stud or a leveling base via its bottom mounting 3/8"-16 threaded hole. While there exists also a anti-twist grove across the bottom mounting hole for direct mounting on a ball head with a long M6 screw through its center hole. However, the usual 0-360° laser engraved scale is missing from the panning base, while after some close inspection, something does not seem right with the labels on the I.S. Dial. According to the dial the focal lengths assigned to the corresponding degrees and stops around are inconsistent in most cases and I fail to see how they've been calculated. Considering that the designer meant FF focal lengths, either in portrait or in landscape the numbers don't match. There's nothing dramatic about it though, other than misleading, since if one used the combination of the suggested focal length with the interval stops, the most that would happen would be to have very little to not any overlap between the shots. Somehow this shows that the designers are unfamiliar with the subject and in this case if I were Benro, I would rather avoid labeling the I.S. Dial with focal lengths and allow the user decide what's best for the task. Otherwise, a manual with correct focal length suggestions for each selection would be more appropriate. Anyway in conclusion, I would say that Photokina 2014 was the commencement of a new era where the classic Manfrotto® style indexing with plungers was abandoned in favor of new Click Stop Selector solutions. With new plunger-less Panoramic Indexing Rotator models coming from Benro®, Novoflex® and Sunwayfoto® I have plenty of work reviewing them. 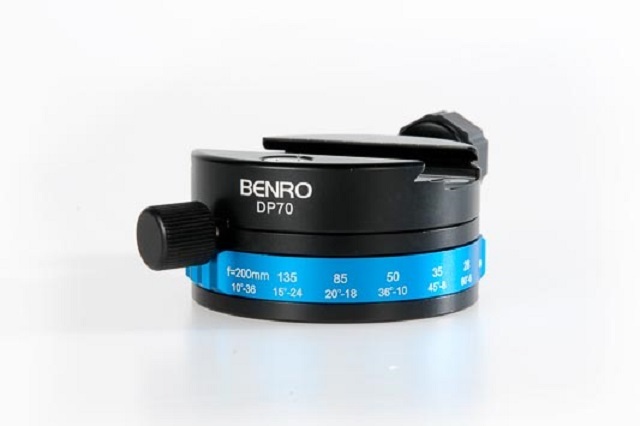 Only references found on Benro DP70 were in the Benro Netherlands website with only a price tag of EUR 129.00 and in a shop at AliExpress selling quite awkwardly for much less at US$ 88.24.